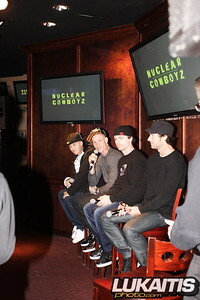 3 members of the Nuclear Cowboyz tour were in Manhattan early this week in preparation for this weekends tour dates at New Jersey’s Izod Center. Ronnie Faisst, Nate Adams, and Jeremy Stenberg along with show organizer Micky Dymond took part in a meet and greet press conference with the local media at the ESPN Zone in Times Square. They explained to the assembled press the concept behind the show and answered questions about freestyle motocross and took photos for the various media outlets on hand.